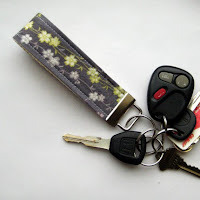 Had been admiring key fobs over at Etsy shops like the one above for the longest time! I think it's very convenient so that you don't have to grab and hold your keys anymore. Just slide it to your wrist and your hands are free to hold anything else. These are the first two I made after I found a similarly clasped d-ring. At Etsy, the hardware is of square ring for use on 1 inch cotton webbing. This alternative hardware is of d-ring but the size is of a 3/4 inch. Much more suitable for us! These 2 went out for family and friend.